Throughout my life as a fan of the Chicago Cubs, I’ve seen all manner of prospects make their big league debuts. Whether it’s a player like Corey Patterson, touted for his five-tool ability, or a player like Mark Prior, who came out of college touted as the best pitcher to ever toe a slab, the team has had plenty of guys for me and my fellow fans to be excited about. Kris Bryant is different. Kris Bryant is a different animal altogether. Ever since the Cubs grabbed him with the second pick in the 2013 MLB Draft, I’ve kept an eye on his stats on a weekly, sometimes daily basis. I watched a few of his college games before that, but it was when the Cubs selected him in the draft that I fully grasped the enormity of what Theo Epstein and Jed Hoyer had pulled off. This guy is a special player, and he was going to be playing for my favorite team. 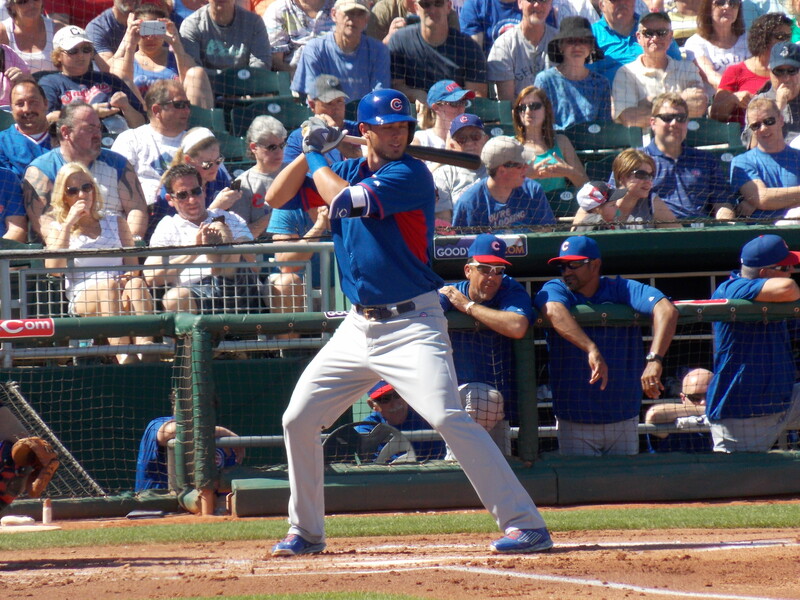 Seeing him in person for the first time in spring training in 2014 was a bit of a letdown. He bobbled an easy play at third base (before he ultimately made the throw across), and he was stranded in the on-deck circle before I even got a chance to see him hit. This spring was a heck of a lot different, as I got to witness his home run against the Cleveland Indians (you know the one, as it was part of the trio of consecutive home runs by Bryant, Javier Baez, and Jorge Soler) and I got to witness two more when I saw the Cubs play against the Seattle Mariners. All I could do for that second set of bombs was whistle, because I was in the press box and aggressive fist-pumping and hooting is generally frowned upon. Today will be the first time Bryant will be in the lineup for the Cubs, and he will be batting fourth for Joe Maddon. That sentence doesn’t have any particular meaning other than this: it feels like a dream to me. Ever since Maddon led the Tampa Bay Rays to the World Series in 2008, I’d harbored fantasies about him managing on the North Side. Adding a guy like Bryant to the mix only heightens the sense for me that this team is becoming something special. At the same time that I’m salivating over the possibility of Bryant hitting in the heart of the order for the next seven years (thanks arcane MLB free agency rules! ), I’m also well aware of the fact that the Cubs are a team that historically hasn’t had much to cheer about when it comes to homegrown talent. Guys like Ryne Sandberg (acquired from the Philadelphia Phillies in a trade) are about as close as we can get to that, but Bryant could be this team’s Ken Griffey Jr. He could be this team’s Mike Trout. He could become the prize that the Cubs didn’t steal. He could become the shiniest crown jewel. Feeling the sense of giddiness that I do about Bryant becoming a member of the Chicago Cubs is an emotion that I hope I never lose. Writing about the Chicago Blackhawks and Chicago Bears full time for NBC, I feel like my enthusiasm for both teams has dulled over the years. That isn’t a bad thing, and is in fact beneficial as I try to dispassionately analyze both teams. I do miss that rush of adrenaline that I used to get, and baseball has become one of the only outlets I have when I’m looking to get my “fan on,” so to speak. Bryant reminds me that sports are supposed to be fun. Bryant reminds me that it’s okay to get really excited about something in the sports world. Today is going to be a day that a lot of us are going to remember for a long time, and I hope it’s another step up the ladder toward a championship that would mean more to me than I probably realize as I type these words.